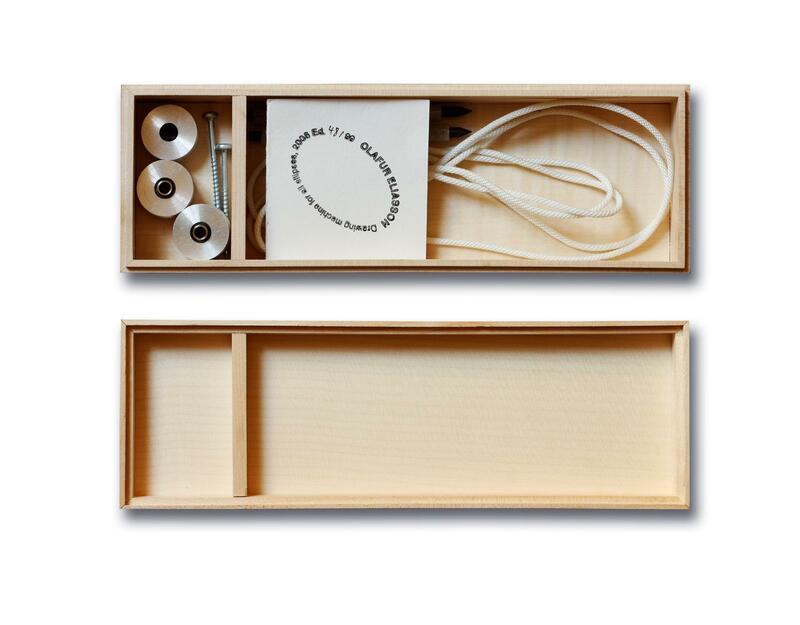 A machine in the most minimal sense, Drawing machine for all ellipses consists of three grooved pulleys, a small piece of cord, and a stick of graphite. Two of the pulleys are fixed with screws to a flat surface, such as a wall, and the graphite is inserted through the third pulley. The cord is threaded between all three pulleys and stretched taught into a triangle. The user then pulls the third and unfixed pulley in either a clockwise or counterclockwise motion, keeping the graphite against the surface. Depending on the distance between the two fixed pulleys, a shorter or broader ellipse results as the graphite makes its orbit around them, dragged against the drawing surface.